On another subject, would any of the members who may have been in say Properties in the old days, have recollections of the issue, use and eventual recall of the Bank’s revolvers? I think most would’ve been .38 cal. Webley Scotts. I made enquiries to Helen Cadzow, Historical Services Manager, at Property Services, NAB Melbourne to see if there were any revolvers in their collection, however she advised that they didn’t have any and she thinks that all the NBA ones were recalled a few years before merger and there were a few that were in the Archives for a period but were eventually handed over to the Police for destruction I assume. The only remaining item on display from that weapons collection is a CBC Bank holster, a picture of which is from the Archives and was provided by Helen Cadzow. 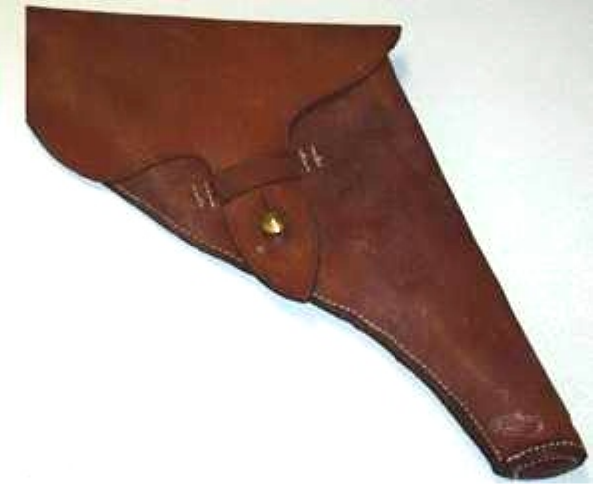 CBC Bank holster for a .38 cal. Revolver on display at NAB Historical Servivces, Melbourne. I remember someone from, the then Properties section, collecting the two Webley Scotts from Corowa branch when I was Manager around 1980 and before merger. One had a plastic handle and the other had a wooden handle. I think there were instructions in the green “Procedure Manual” that the guns were to be fired on a (sort of) regular basis and to clear the stock of cartridges before ordering a new lot on the stationery order. They were in boxes of fifty. My staff and I used to go out to a customer’s farm property occasionally to shoot a few boxes of rounds into a dam. All good fun, however the girls weren’t all that keen on the process. None of us were very good shots either, and the farmer made sure that all the nearby sheep were secured! As I recall the CBC had two types of revolvers. Both were Welby & Scott .38 calibre – one a long barrel one and the other a short barrel one. The short barrel ones were newer models. Some of the ammunition we had was often very old and not very good. I recall being able to see the bullets in transit on one occasion. When I was Business Promotions Officer in Queensland 1971 to 1977 one of my side responsibilities was security. I used to load plastic .38 bullets on my kitchen table some nights and I would then go to a branch the following afternoon, after hours, erect some bags and a target at the end of the customer area and train the staff in firearm use and safety. There was no gun powder in the plastic bullets. The force of the cap would fire the plastic projectile quite accurately for five metres or so. We would collect the spent shell and projectiles and reload them. The CBC holster in archives could be the one I had manufactured in Brisbane in about 1973 before Bob Gibson, then manager Cairns, and I went to Karumba on the Gulf of Carpentaria to open an Agency. I carried the revolver on my belt and Bob carried a leather Gladstone bag with $60,000 in cash on the 500km flight from Cairns to Karumba. Obviously we had advised the aircraft company of our purpose and there were no problems but we did put the bag of cash in the nose compartment of the plane for the journey. Can you imagine getting on a plane today with a revolver on your belt? Our picture was in the Cairns Post at the time. The late Brian Boran, then Qld Relieving Staff, ran the Agency for a couple of years, single handedly. He used to lock the two key safe at the end of the day, and go the Lodge,(Hotel) where he lived. He would give one safe key to Mrs. Alexander, who ran the Hotel, and keep the other one himself. He would sleep with the revolver under his pillow. After the revolvers were recalled there were 1500 of them is a safe at 343 George St. I came to Sydney from Brisbane in January 1984 and I remember, soon after, arranging with a buyer on the West Coast of America, I think he was in LA who offered $10 each for the whole lot. I can’t recall who in our State Office was handling the matter but I have always assumed that they went to the US. They would have been a real bargain at that price as they were pretty much unused and in very good condition but they were unsaleable in Australia. Maybe someone from Properties has more precise detail on the eventual sale or destruction on them. Thank you, John, for forwarding the excellent information re the Webley & Scott .38 revolvers. My recollection of those at 315 High Street, Maitland were that they were the long-barrelled type. We used to have occasional practice at Morpeth Rifle Range. The bullets were indeed old - one caught fire in the revolver, another time the bullet stayed in the gun after the trigger was pulled - the young chap firing it peered down the barrel & said 'it didn't come out!?' I remember the manager contacting the police at one stage because the bullets were weeping in the boxes - the police contacted Singleton Army Camp & someone was sent down to dispose of them. On Wednesdays I'd go to the Commonwealth Bank to pick up cash for the Council pays the following day. On one occasion I was accompanied by the junior teller, a cocky young chap driving his red MG - after we picked up the cash in the huge leather bag he begged me to let him carry the gun - which I did, struggling to carry the bag on my own. I turned around to see said young man (whose name I remember to this day!) strutting down High Street, Maitland, twirling the gun around his index finger like something out of the Wild West! As previously mentioned, can you imagine this happening today! Great memories!